IAHTA - Understanding Sterilization ; An action to kill pathogenic germs and apatogens along with spores on treatment and medical equipment by boiling, stoom, high heat, or using chemicals. Equipment made of metal, for example tweezers, scissors, speculum and others. Equipment made of glass, for example syringes, chemical tubes and others. Equipment made of rubber, for example, a catheter, gloves, pipe hull, drain and others. Equipment made from e-mail, such as bent (nierbekken), basin and others. Tools made of plastic, such as slang i8nfus and others. Equipment made of woven, such as gauze, tampon, doek operation, clothes, bed sheets, pillowcases and others. Mensterikan equipment by boiling in water until boiling (1000C) and wait between 15 to 20 minutes. For example equipment from metal, glass and rubber. equipment with steam in the autoclave with time, temperature and pressure. For example looms, medicines and others. (3) Sterilization by dry heat. Clean the equipment with an oven with high heat steam. For example sharp metal equipment, glass equipment and certain drugs. Sterilize equipment using chemicals such as alcohol, sublimate, formalin vapor, especially for equipment that is quickly damaged when the heat is hot. For example gloves, catheters, etc. (1) The sterilizer must be ready to use. (2) Equipment must be clean and work effectively. (3) Wrapped equipment must be labeled that clearly states: name, type of equipment, sterilized date and time. (4) Arranging equipment in the sterilizer must be such that all parts can be sterilized. (5) The time needed to sterilize each type of equipment must be appropriate (calculated from the time the equipment is sterilized). (6) It is prohibited to insert or add other equipment into the sterilizer, before the time to sterilize is complete. (7) Transferring equipment that has been sterile where it must be with a sterile corrector. (8) To cool sterile equipment, it is prohibited to open the wrapper or lid. (9) If the newly sterilized equipment is open, the equipment must be re-sterilized. Carry out maintenance of care and medical equipment by cleaning, disinfecting or sterilizing and storing them. (1) Preparing treatment and medical equipment in a state of ready use. (2) Prevent equipment from being damaged quickly. a. Maintenance of Metal Equipment. (2) The place of washing with sprinkling water or a basin of clean water. (9) Stalisator is ready to use. (1) Equipment that has been used, rinsed water (preferably under running water) to remove dirt that is attached, then soaked in a disinfectant solution for at least two hours. Especially equipment that has been used in patients with infectious diseases, must be soaked for at least 24 hours. (2) Equipment is occupied by one, then rinsed. Then sterilized by boiling in a sterilizer that has been filled with enough water, cooked until boiling. After boiling water at least = - at least 15 minutes just lifted. (3) Equipment that has been sterilized, removed or moved with a sterile probe where the sterilization is sterile. (4) After completion, the equipment is cleaned, fixed and returned to its original place. Special sharp metal equipment (such as knives, scissors, needles etc.) must be wrapped in gauze first, then put into the sterilizer, after boiling water and waiting for three to five minutes to be removed. b. Equipment Maintenance from Glass. (2) Washing place with running water or a basin containing clean water. (9) Sterilizers are ready to use. Same as the maintenance of equipment for high-quality dams. But specifically the syringe, the sucker is removed and the needle is removed, then each tool is wrapped in gauze, and after that it is inserted into the sterilizer that has been filled with water and blended side by side. c. Maintenance of Rubber Equipment. (2) Pipe of the stomach or maagslang estimator. (2) Washing place with running water or basin. (6) Clean cotton and place. (8) Sterilizers are ready to use. (1) equipment is cleaned and if there are plastic marks removed with clean cotton. (2) The inside is cleaned by spraying water from syringes or running water while being massaged until clean. (3) After cleaning, the equipment is then soaked in a disinfectant solution for at least two hours, then soaped and rinsed. 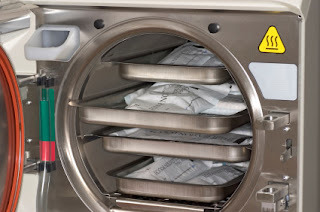 (4) After the water in the sterilizer boils, the equipment is inserted and left between five to ten minutes, then removed with a sterile contour. After that the equipment is stored in a sterile place. (5) After completion, the equipment is cleaned, cleaned and returned to its original place. (1) Dirty gloves (used used). (2) Washing place with running water or a basin of clean water. (4) Wipe dry or towel. (7) A drum or jar that is tightly closed. (1) Gloves are cleaned and disinfected to the outside and inside, then rinsed. (2) Gloves are checked for leaking or not, by entering air into it, then dipping it into water. When leak is separated. (3) After cleaning, the gloves are dried by hanging them upside down or directly dried out and inside with a towel or dry cloth. (4) Give evenly thin powder on the outside and inside. (5) Gloves are arranged or rolled in pairs or separated, for example, one group is left or right. If only left or right separated, clear identification labels on each drum or jar indicate the right or left, and the date and time of the start of sterilization. (6) The gloves are then inserted into the drum or jar which has been filled with tablets of formalin to be sterilized for 24 hours from the time they are inserted. For one liter size drum or jar, four formalin tablets of 50 grams were used. (7) After completion, the equipment is cleaned, cleaned and returned to its original place.